One of the most common issues of adults at the age between 20 and 30 is premature aging of their hair, which is often a result of stress, sinusitis, genetic predisposition, poor nutrition, hormonal fluctuations, thyroid disorders, and chronic colds. The color of the hair is due to melanin, and in the case of its reduced amounts, it becomes gray or white. This pigment’s activity is lowered with age, so the body slowly stops its production. Fortunately, grayish strands can be solved in a natural way. Initially, you should make sure your diet is rich in vitamins and minerals like iodine, iron, Vitamin B, and copper in order to prevent further development of the problem. 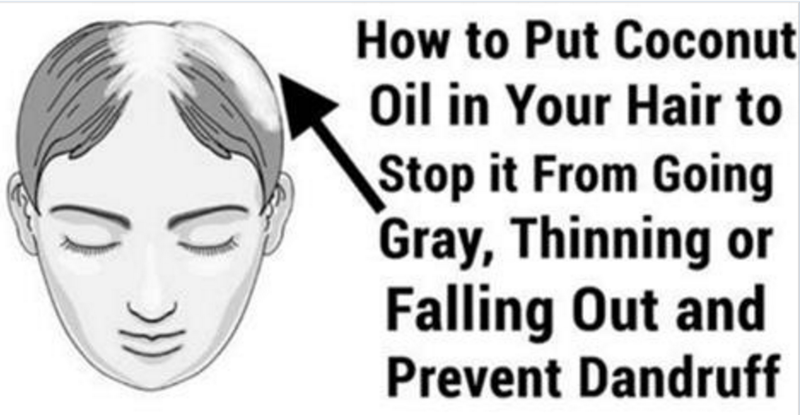 oil directly on your hair. You should boil few dried Indian gooseberries or amla powder in a coconut oil, leave it to cool and apply it on the scalp and hair. Leave it to act until the next morning, and then wash the hair. This treatment should be repeated twice a week. Another way to use it is to mix a tablespoon of lemon juice with a tablespoon of amla pulp and massage the scalp before going to sleep. Wash it off the next morning. You may also mix almond oil and Indian gooseberry juice, and apply it on the hair to prevent graying of your hair and boost the hair growth. Curry leaves can help you stimulate the hair’s pigmentation if you mix it with coconut oil. This combination may also be used as a hair tonic. Pour a tablespoon of coconut oil in a pan, add a few fresh curry leaves and boil them until they get charred. Then, stir and apply it on the hair. Leave it to act for 30-45 minutes, and rinse it off. Repeat this twice a week. Moreover, it would be very helpful to drink curry juice daily. Henna strengthens the lustrous locks and darkens the hair. You should make a paste of a tablespoon of coffee powder, ground henna leaves, 3 tablespoons of Indian gooseberry powder, and some plain yogurt. Then, apply the paste on the hair and leave it to dry. Rinse as usually, and repeat once or twice a month. 3 hours, and then wash it off with a shampoo. You can also use the amazing benefits of henna if you boil some henna leaves in mustard or coconut oil, until they are charred, and apply the mixture on the hair. Coconut oil is extremely beneficial and has a wide range of uses. It stimulates the hair growth, moisturizes it, fights infections. Moreover, it is high in antioxidants, so its longer use effectively reverses the gray hair. You should add three tablespoons of lemon juice in some coconut oil, apply their combination to the hair, and massage the scalp. Leave it to act for 1 hour, and then wash it off with a shampoo. Repeat this treatment once a week. Sage and rosemary are extremely effective in darkening gray hairs. You should add half a cup of dried leaves of these herbs in a pot with 2 cups of water. Boil the leaves and leave them for several hours. Then, strain and use it to rinse the hair after shampooing. Leave it to act for 15-20 minutes, and then wash it off. Do this treatment once a week. This is a popular home remedy for graying hair, as it produces a pigment which effectively reduces gray hair. The consumption of blackstrap molasses will provide 14 percent of the recommended daily dosage of copper, as well as high amounts of iron, magnesium, and selenium. Hence, you should take a tablespoon of blackstrap molasses every morning for a few months. Onion juice is of great help in this case, and experts claim that graying of the hair is due to accumulation of hydrogen peroxide at the bases of hair follicles bases, and this juice supports the production of catalase. Therefore, you should massage the scalp with onion juice, leave it to act for half an hour, and rinse. Repeat on a daily basis for a few weeks. Black tea efficiently darkens and softens the hair, and it will also provide a fantastic shine. You should boil 2 tablespoons of the tea in a cup of water, then add a teaspoon of salt, and let it cool. Use the tea to wash the hair a few times, and leave it to act for 20 minutes on the last time. Afterward, wash it off with cold water, but do not use a shampoo. Repeat this procedure once or twice a week, and you can also add some ground coffee to your hair conditioner to boost the effects. Amaranth effectively restores the natural hair color, fights hair loss, and prevents graying. You should wash the hair, apply fresh juice extracted from the amaranth leaves on the hair and scalp, and rinse with water. Black sesame seeds as genuinely efficient in treating the reason for early graying of hair, as they support melanocyte activity to boost the production of melanin. They are also high in protein, iron, copper, magnesium, phosphorus, they also reduce gray hairs. You should take a teaspoon of these seeds on a daily basis for 3 months. The regular use of these homemade remedies for early graying of hair undoubtedly provide positive effects after some time.